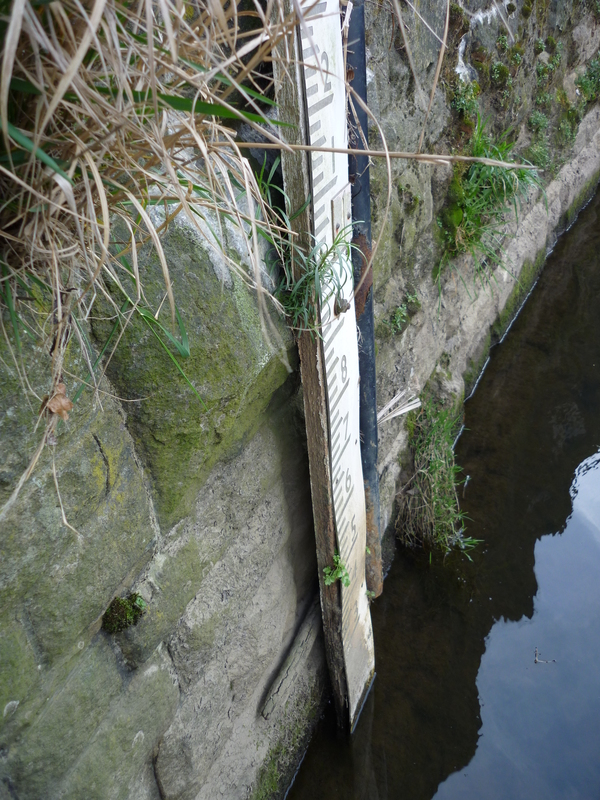 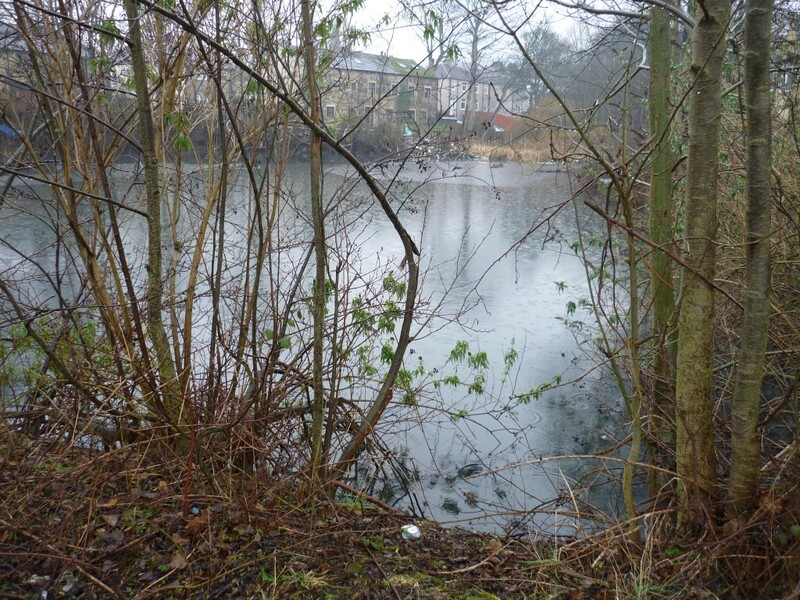 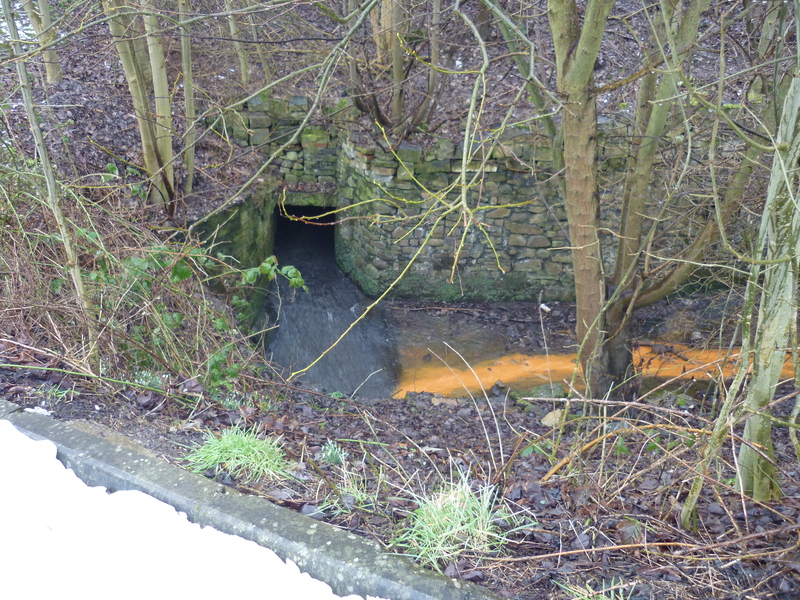 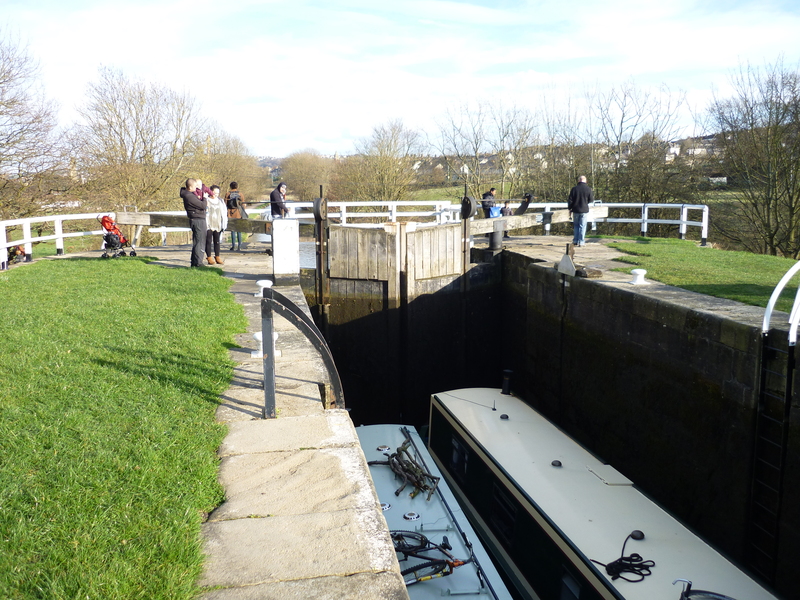 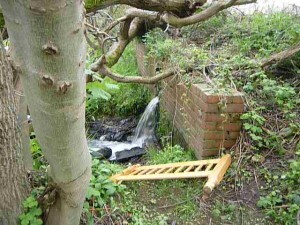 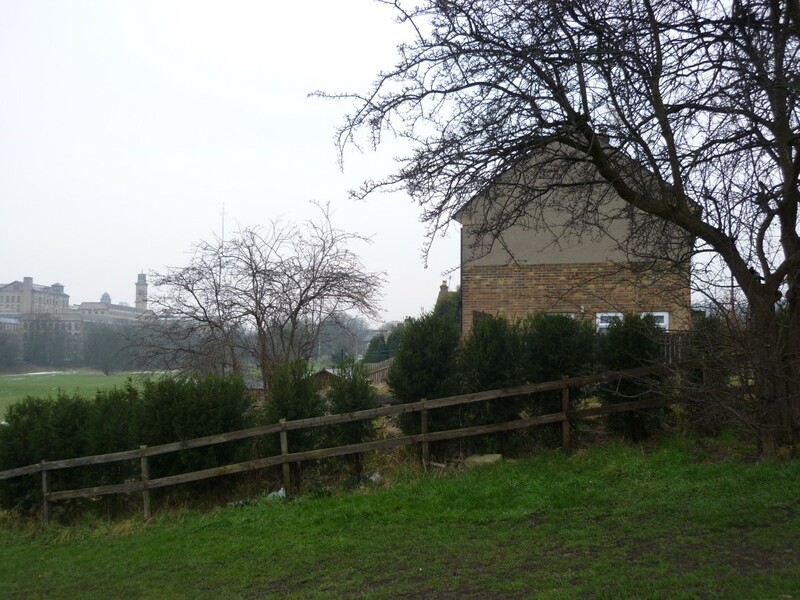 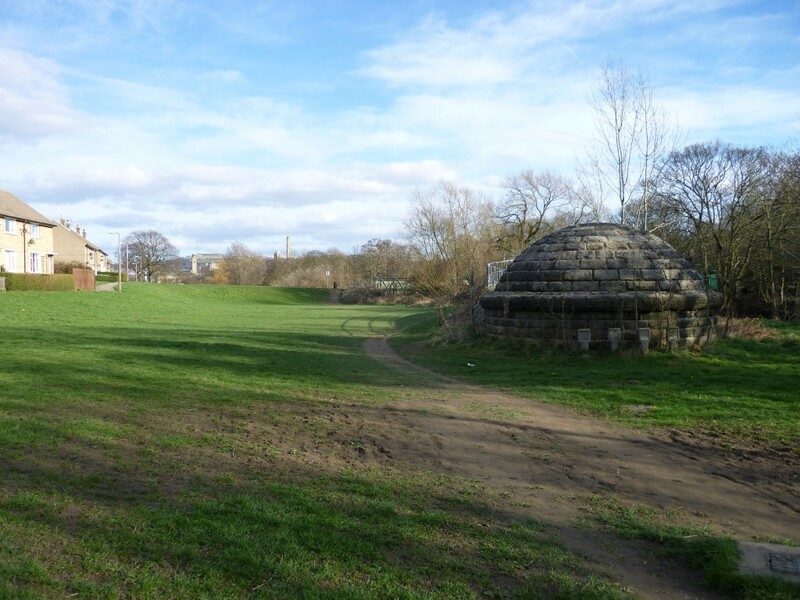 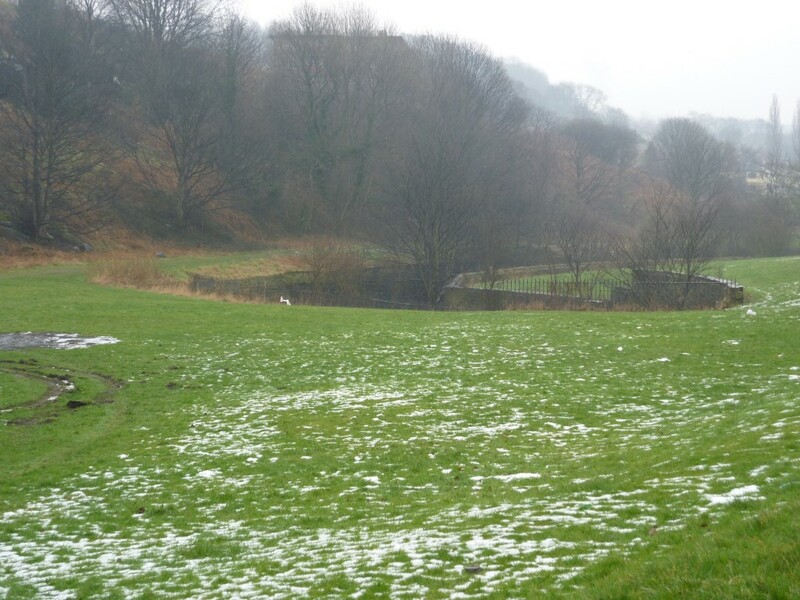 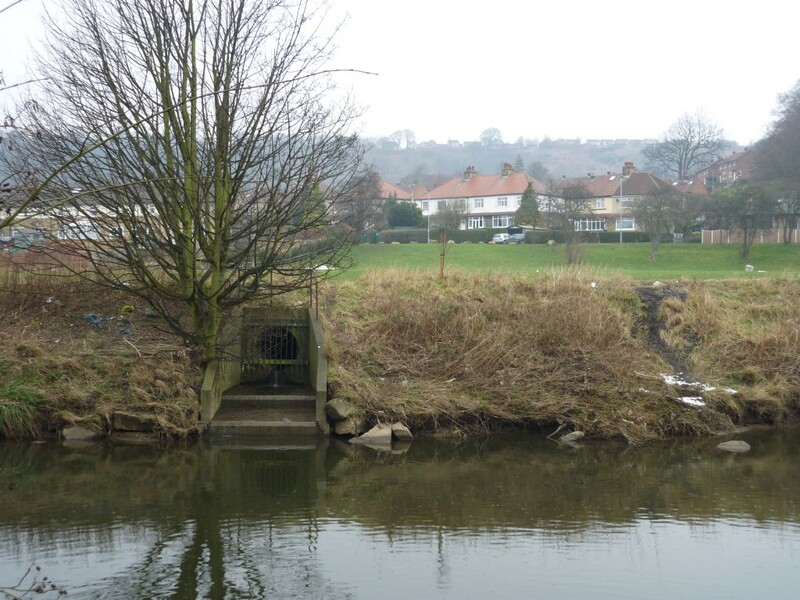 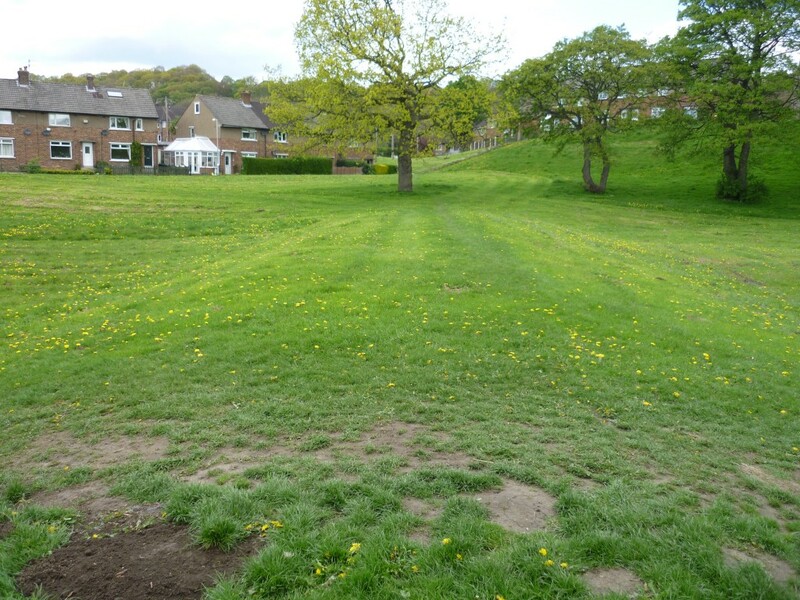 The following “photo tour” of waterways in the Shipley area was created for this site at the beginning of our project in 2012. 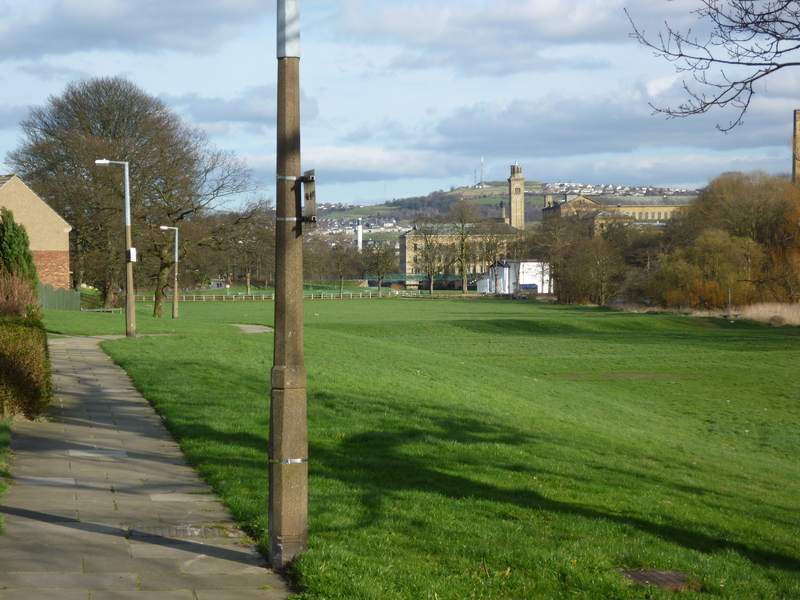 In the next image (below), further down the green space adjacent to the river, you can plainly see a rise in the land which covers over one of the drainage pipes channelling downhill water into the river… The houses in the background are part of Coniston Grove – just one of many streets named after major lakes, as if in recognition of the once very watery character of this landscape! 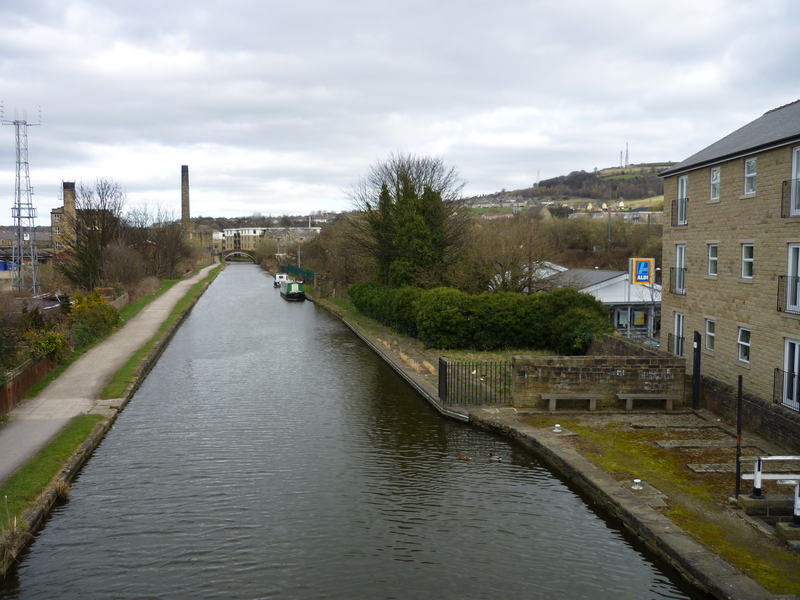 Let’s not forget the canal (below). 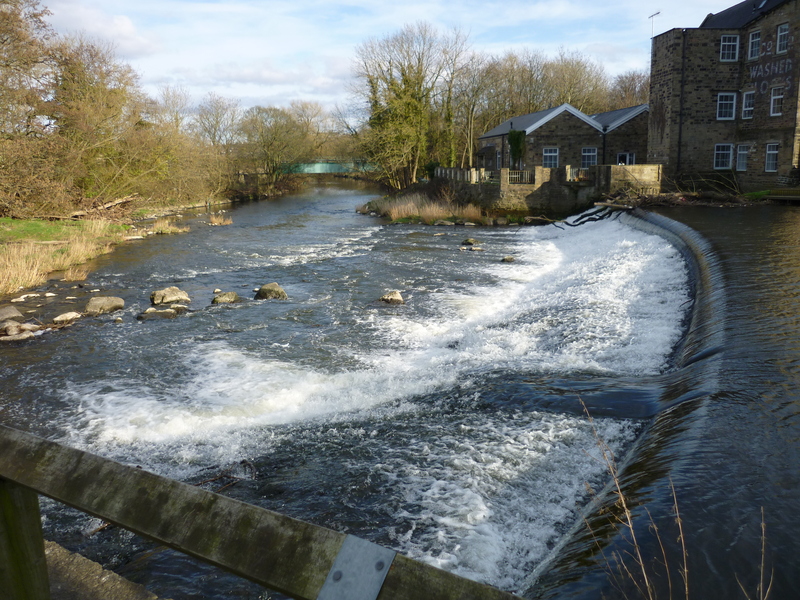 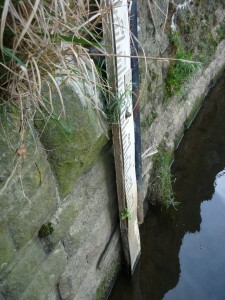 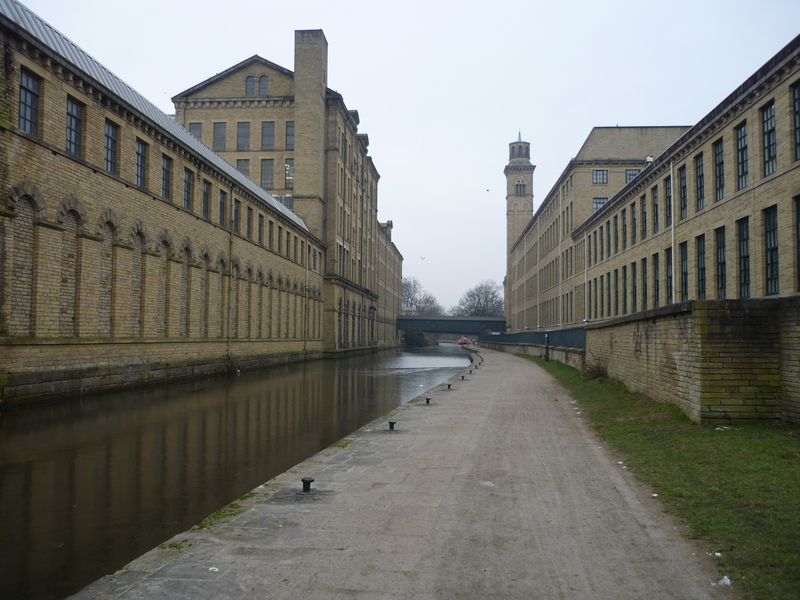 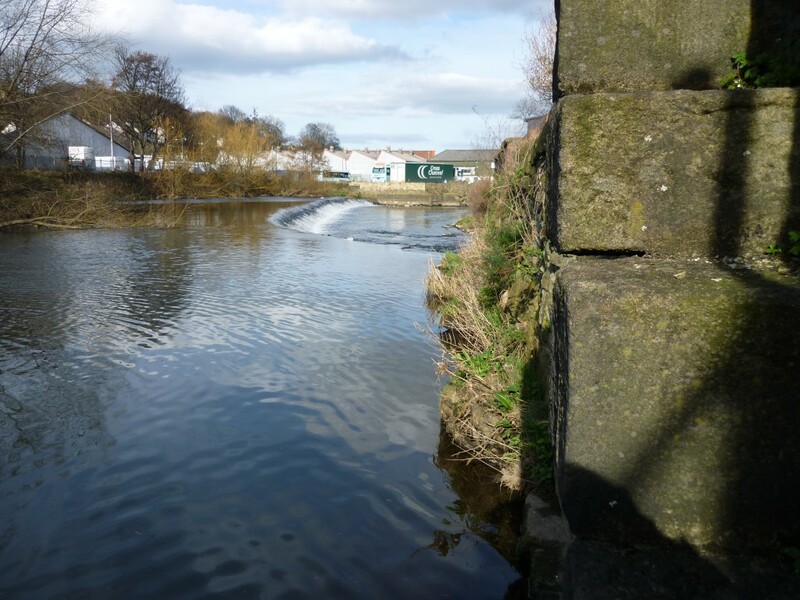 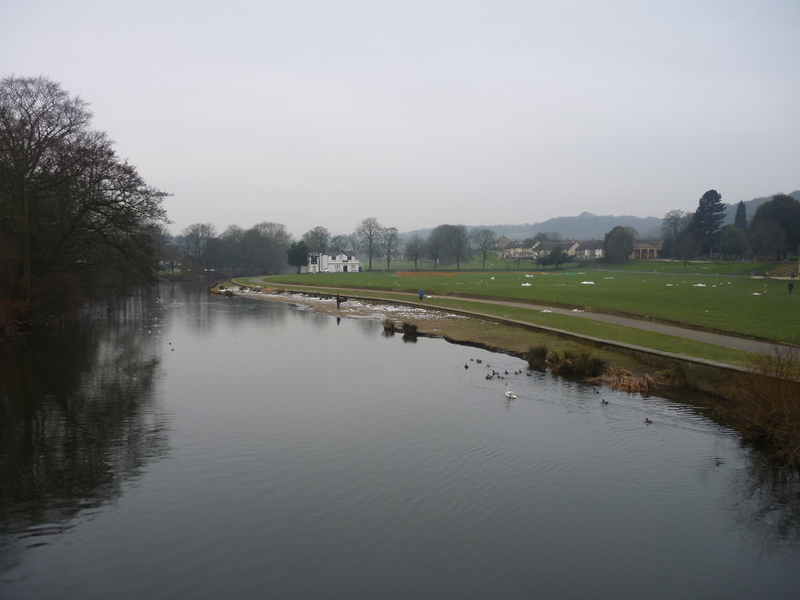 At Saltaire, it sits especially close to the river, which is of course why Titus Salt put Saltaire here in the first place. 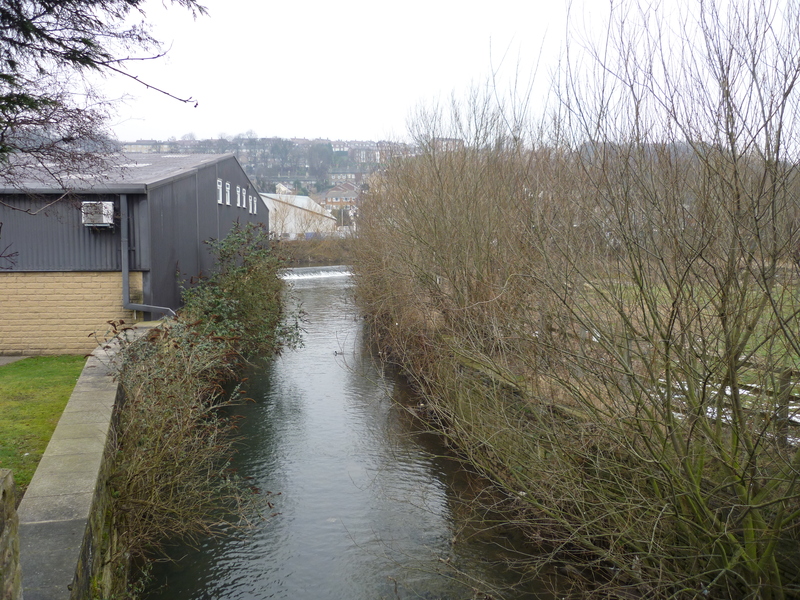 The canal provided the key transportation route for the mill’s goods, whereas the river (directly on the other side of the mill building to the left) provided water power… is the river. 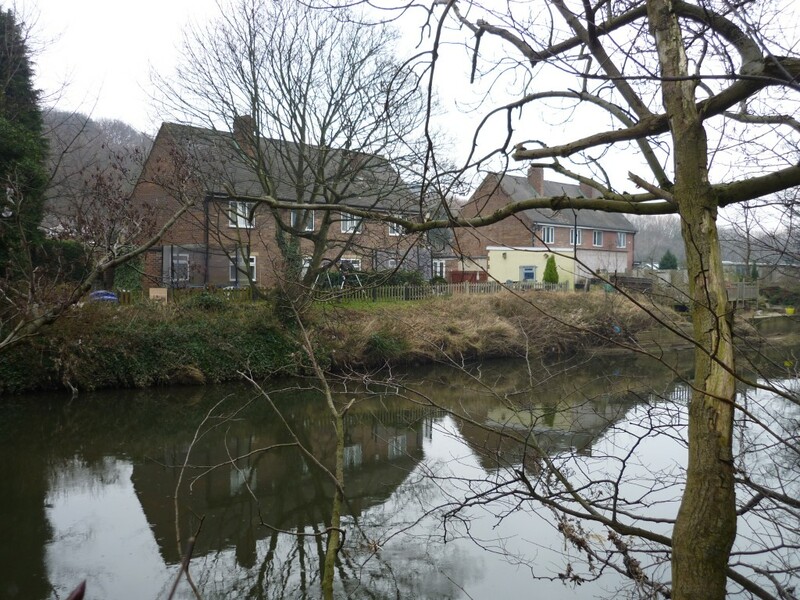 And here, a touch further downstream, we find Aire Close, four homes built right on the water’s edge… I’m told these houses were once occupied by river agency employees, which might explain why the usual flood plain precautions are ignored just here. But what a lovely spot to live! 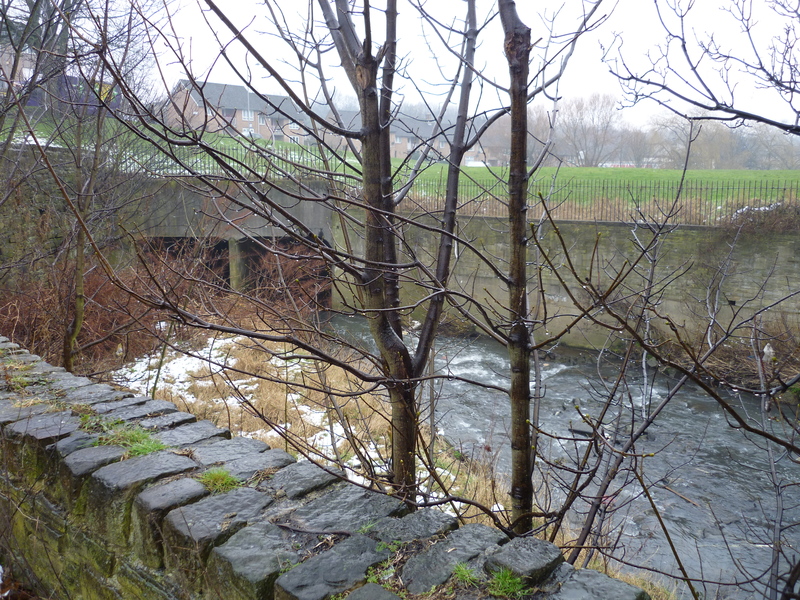 textA little further downstream still, that industrial landscape becomes industrial wasteland. 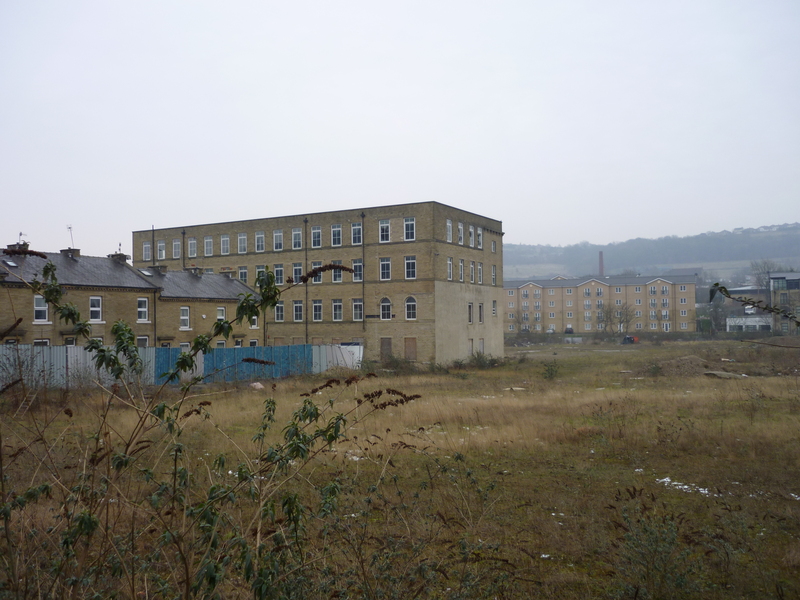 Here’s Lower Holme Mills (now abandoned), and in the distance new housing developments on the Shipley side of the river. 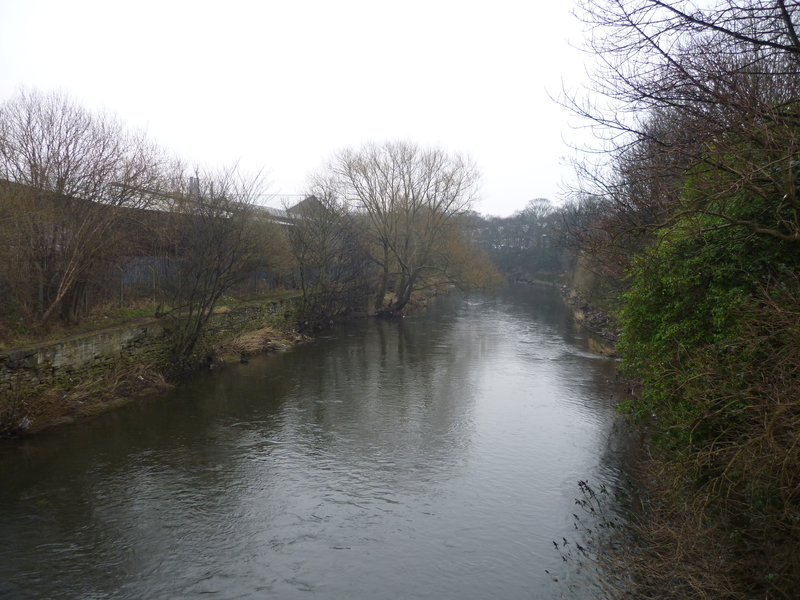 And here’s the river itself, just past this point, now edged on both sides by more commercial buildings (see blog posting “Walking with Kevin Sunderland”), as the water wends its way on towards Esholt. 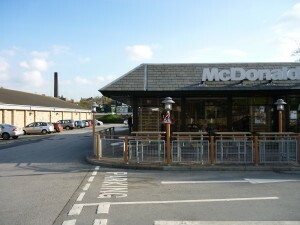 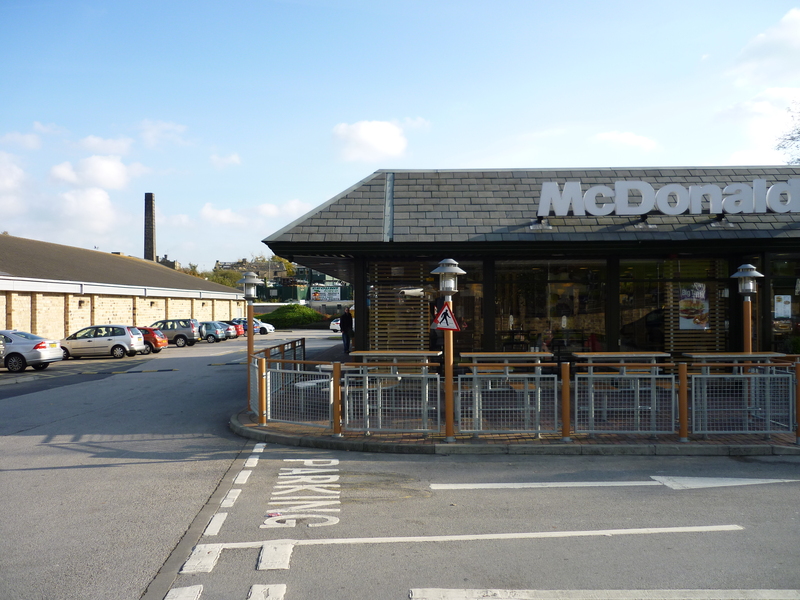 Next to the Aldi is the local McDonalds, of course… And Bradford Beck flows all the way around the edge of the car park — it’s tucked away invisibly at the back of the picture below. 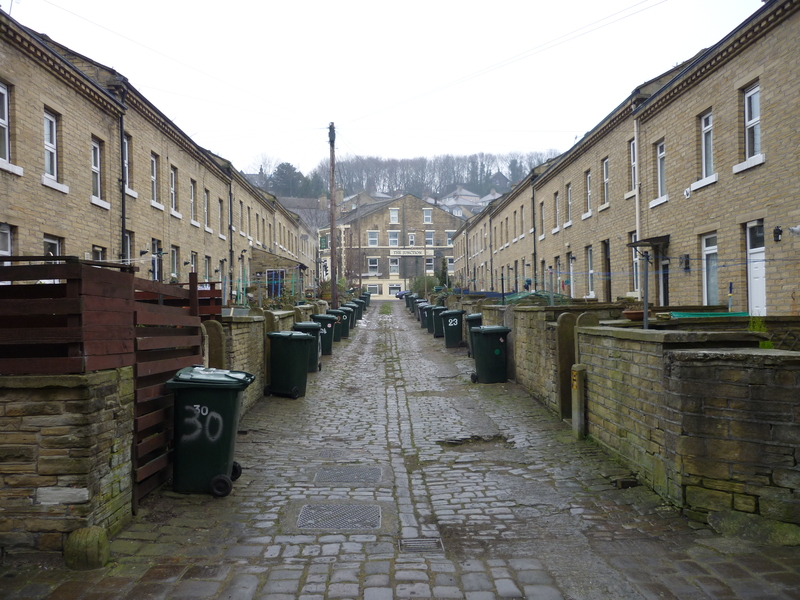 There are some beautiful old Victorian (?) 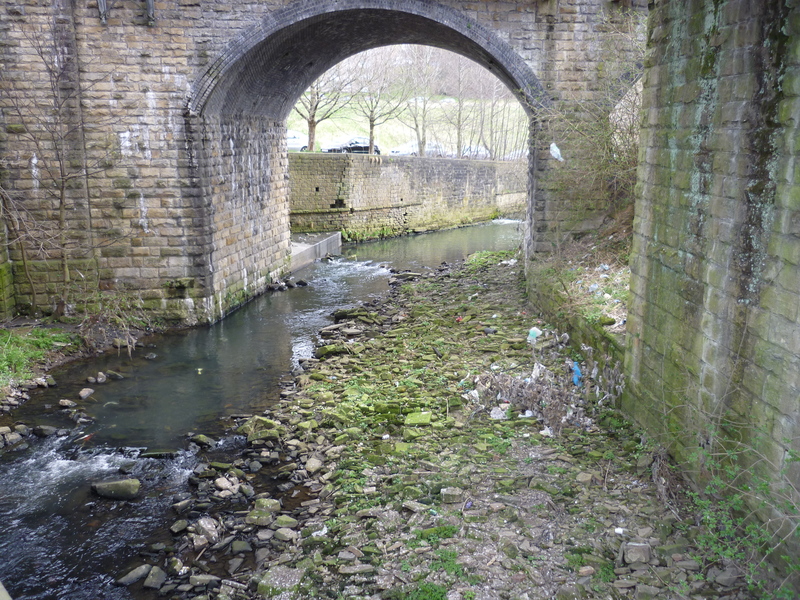 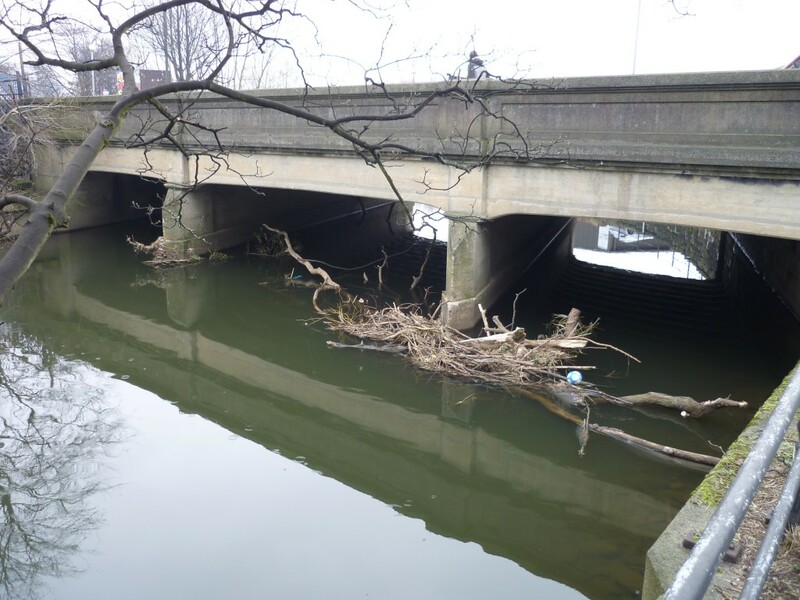 arches here, supporting this transport infrastructure… Note the low water level here, in a picture taken before most of this year’s April-May rain! 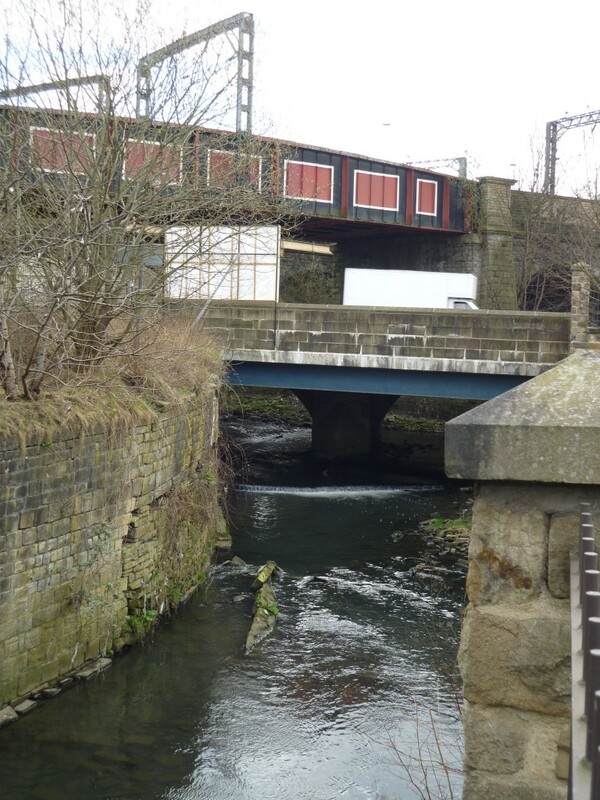 I have really enjoyed looking through all these photos of the river/canal Shipley also of Bradford brings back happy memories.